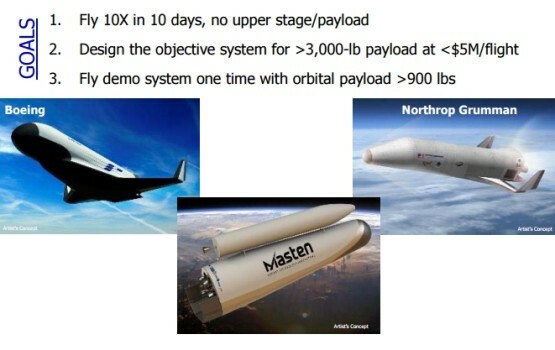 According to the DARPA presentation, the XS-1 project carries four prioritized goals: the design of a reusable booster system with launch costs traceable to <$5M/flight; to fly the booster 10 times in 10 days; to demonstrate an immediate payload to orbit capability with cost traceability to the Operational System; and to enable routine, low-cost space access. Each of these four prioritized goals carries a test objective and a test threshold. 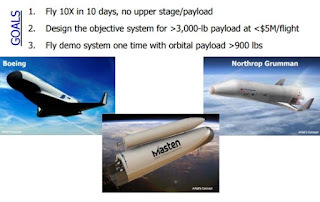 For a reusable booster with a cost per flight of less than $5 million USD, DARPA has set a test objective that XS-1 be able to transport equal to or greater than 3,000 lbs to a 100 nmi reference orbit inclined 90 degrees. The threshold of this objective currently stands at an identical payload capacity to a 100 nmi reference orbit inclined 28.5 degrees. For the flight rate goal, DARPA’s stated test objective is to achieve 10 flights in 10 consecutive days – even when weather, range, and emergency delays are accounted for (threshold). For an immediate demonstration of a payload to orbit capability, the objective is to be able to carry equal to or greater than 1,500 lbs to a 100 nmi orbit inclined 28.5 degrees due east, with a threshold payload of equal to or greater than 900 lbs to the same target orbit parameters. 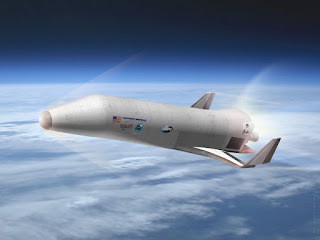 To enable this routine access to space, DARPA hopes to “fly the XS-1 to Mach 10+ at least once, and stage at high Mach to minimize the size and cost of the upper stage, “ with a stated developmental threshold for this at Mach 3+ travelling speeds and Mach 2+ staging speeds. with the presentation containing different notional designs for the XS-1 from Boeing, Masten, and Northrop Grumman – among others. Moreover, DARPA notes that the XS-1 could be a winged or unwinged vehicle. It could also be a payload carriage craft. Given the broad range of potential designs, XS-1 could be a horizontal launch/horizontal land vehicle, a vertical launch/horizontal land vehicle, or a vertical launch/vertical land vehicle. It could launch from the ground, air, or sea barge and could either land downrange or return to land at its launch site.